Exceptional family home features a large modern kitchen flowing into multiple open plan internal and external living and dining areas. Expansive windows let you take in the amazing views from throughout the house. This is an all year round home. 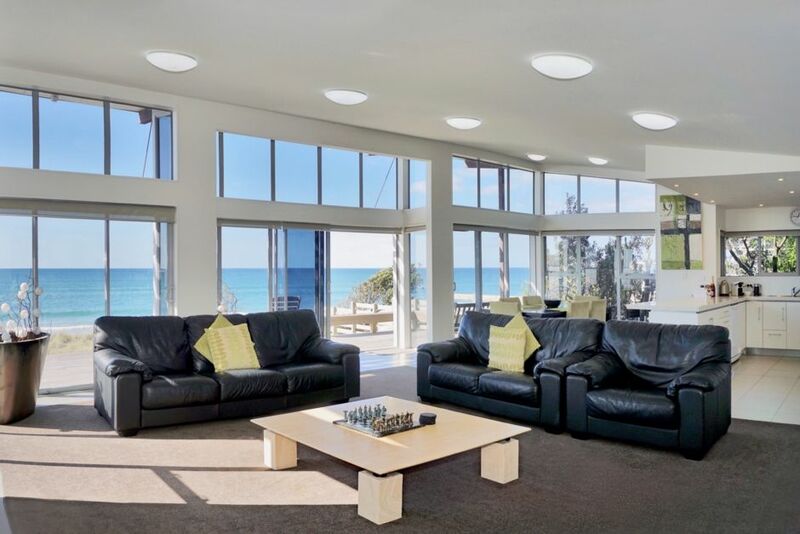 Built in two sections, the beachfront living area is separated by a glass corridor to the sleeping zone. Internal courtyard offers a protected outdoor BBQ and dining area making this property a stunning entertainer's paradise. For those cooler winter nights snuggle up and watch a DVD on the couch in front of the gas fire and heat pump, or work with our open WIFI. The master bedroom has a blissful king size bed, walk in wardrobe and ensuite. There is another comfy king size bed in the second bedroom, and the third room contains single bunks. Both bathrooms offer power showers with quality vanities. The kitchen is fully contained with creature comforts like an ice making fridge and a Nespresso Coffee Machine and foamer! No need to leave the property for the hourly caffeine fix. A fully functioning laundry is in the secure two-car garage. Pukehina hosts two local shops for last-minute items, both have food takeaways and one a bottle store. Local activities comprise a tennis club, golf, surf club with red flags for swimming, boating and fishing clubs. Please bring your own Linen, Towels and tea towels. Alternatively, we can offer to provide luxury linen for you at an additional charge of $25 per person. A $400 security deposit is held for this property and will be returned to you following inspection by property manager and cleaning after your departure. * Families or mature groups happily accepted. * NO parties will be tolerated!! * NO smoking or vaping or other please. Shelley McCarthy Having already established a successful career as the Senior Property Manager with Professionals Real Estate, I have proven my ability to effectively manage multiple properties. During this time I managed the largest portfolio of properties in the company and made regular appearances on the TV programme, “The Renters”. As an organized, efficient professional with articulate business communication skills, I take pride in delivering quality service and conducting business with integrity. My natural and positive outlook supports my energetic approach to achieving objectives, which is complimented with the ability to quickly determine the needs of others. I am highly passionate about what I do and am committed to professionally act on your behalf to create mutual benefit to you as the property owner and to guests, accurately matching homes to suitably screened guests. Jody Beattie Administration and Marketing Manager I discovered Pukehina over 5 years ago and fell in love with the place. We came with the agent to see a 5 hectare block of land and never looked back! I have had experience in various different industries over the years, and am proficient at keeping many balls in the air at once. My role will be to keep the well-oiled machine working seamlessly by providing top quality administration support and office management. These skills combined with my passion for our piece of paradise will ensure that everything is completed efficiently and with a smile. Great location on the beach. The house is very clean and has everything you could need. Very grateful for the nespresso machine. We hired the linen and it was all high quality. The property is very well kept. The surf club was great with friendly helpful life guards and the hippy pipi was handy for milk bread and ice creams. The owner accommodated our request for an extra roll out bed in the children’s room. We would love to come back again. PUKEHINA PERFECTION!!! Fabulous property and awesome location. PUKEHINA PERFECTION!!! Fabulous property and awesome location. You can’t get much more beachfront than this beauty! Can’t fault it! Our UK family, like us, were well impressed. We’ll be back.